A frequently-asked question on this Web site revolves around the chances for success of a hypothetical Japanese invasion of the Hawaiian Islands. The most popular scenario runs something like this: a victorious Japanese fleet vanquishes the Americans at the Battle of Midway. Instead of losing four carriers to the Americans one, the Japanese manage to reverse the outcome and lose (for the sake of argument) no carriers, while the Americans lose all of theirs. This leaves the Americans with but two carriers in the Pacific (Saratoga and Wasp) to Japan's six fleet carriers and several light carriers. With the U.S. fleet badly outnumbered, and Midway occupied and turned into an advance base for further Japanese expansion, the way would be cleared for a succesful invasion of the Hawaiian Islands that the U.S. would be powerless to resist. And once Hawaii was occupied (so the argument usually continues, somewhat breathlessly), who knows what might happen next? Why, Yamamoto and the Japanese Fleet would be able to roam up and down the Western seaboard of the U.S. at will, spreading carnage in their wake. The U.S. might be forced to back out of it's 'Germany First' strategy with its British allies, or even drop out of the war completely. The potential consequences of losing Midway, therefore, were dire almost beyond calculation! In truth, the Japanese never had the slightest chance of successfully invading Hawaii, whether they triumphed at Midway or not. The main reason for this is the logistical ability of Japan to wage the Pacific War. "Ah, logistics", you say, pursing your lips as if savoring a fine wine, "Nothing quite compares to the thrill of studying logistics." Yeah, right. But as with so many other things, it's the unglamorous facts which are the important ones. Having a grounding in logistics is crucial for developing an understanding of the Pacific War, because it highlights the enormous difficulties which both sides faced in conducting a war across the vast reaches of the Pacific Ocean. And so, without further ado, let's examine what the Japanese were really up against if they decided to try and take Hawaii. The Japanese reverse the outcome of the Battle of Midway and thus retain the services of all six of their large fleet carriers, while the United States Navy loses all three of theirs, and thus has but two left in the whole of the Pacific. The Japanese have successfully captured Midway and are turning it into an advance base. The Japanese can't mount an operation against Hawaii until August, 1942. This is based on Japanese aircraft losses at the Battle of Midway, which are assumed to be moderate to heavy. Historically, the initial raid on Midway cost the Japanese fourteen aircraft either lost or damaged beyond repair, and another twenty-six damaged to one degree or another, from a strike force of 108 aircraft. That's a 13% attrition rate in a single strike. It must be assumed that additional strikes would have been needed against Midway in order to destroy it's remaining aircraft. Similarly, the attacks against the American carriers during the historical battle were also costly. One of the strikes against Yorktown cost the Japanese 13 of the 18 Val dive-bombers involved. Given these sorts of attrition rates, it is difficult to imagine how the Japanese would have come away even from a victory at Midway without substantial losses of aircraft and crews. For the sake of argument, we will say that these losses are replaceable, but they will require two months to effect. This is not unreasonable, in light of Zuikaku's experience refitting her airwings after the Battle of Coral Sea, which took several months. So no offensive operations can be contemplated against Hawaii before August of 1942 at the earliest. And in reality, this is a generous estimate of the Japanese capability to mount the planning effort and mobilization of resources that such an operation would require. Allright then. Granted these conditions, let's examine the obstacles to Japan's succesful invasion of Hawaii in August 1942. They are several, and formidable. First, let's look at what it's gonna take in the way of ground troops to actually capture Hawaii. By April 1942, the Americans had 62,700 Army troops (two full infantry divisions, plus support troops) in Hawaii, and another 8,900 air personnel (H.P. Willmott, "The Barrier and the Javelin", p.169) The U.S. Army expected this total to reach at least 115,000 ground and air personnel. This figure also does not include the thousands of Navy personnel at bases like Pearl Harbor who could also serve as infantry in a pinch. Taken in whole, a Hawaiian garrison of 100,000 U.S. troops seems like a good round number to work with. As a Japanese planner, I would note that the scale of the operation is therefore of roughly the same magnitude as taking Malaya, where the British had initially fielded around 90,000 men. The Japanese had beaten them with three scant combat divisions (around 51,000 men, taking into account that Japanese divisions are smaller than their American counterparts, but also that the Japanese formations in Malaya had been bolstered considerably by additional engineering dettachments). The Japanese had also waged a successful campaign against the Americans on Luzon, where they were outnumbered 35,000 to 42,000. Taking these as analogs, one might contemplate a force of between 60-80,000 men to be victorious against a Hawaiian garrison of around 100,000 Americans. Indeed, a January, 1942, estimate by the Combined Fleet staff put the necessary force as being three divisions. We'll settle on roughly 60,000 men, in the form of three full-strength combat divisions and auxiliaries. As it turns out, there is every reason to believe that Combined Fleet's staff was hopelessly optimistic in its belief that three divisions could wrest Hawaii from the Americans. There are a number of crucial differences between a Hawaiian operation and the early-war scenarios that suggest the Japanese would have needed a much larger force. First, Malaya and Luzon comprised enormous territories (49,000 and 40,000 square miles, respectively), whereas the Hawaiian Islands in total are a relatively compact 6,423 square miles. Of that, only the mid-size island of Oahu (where Pearl Harbor, Honolulu, and several airfields were located) need be actively defended by the Americans. Consequently, the Americans could afford to deploy in depth around important objectives, a luxury which the defenders of Luzon and Malaya did not enjoy. As a result, the flanking attacks which the Japanese used to such good effect in Malaya would be much more difficult to develop in Hawaii, because American defensive positions would be shorter, better anchored, and deeper, thus making them much more difficult to dislodge laterally. 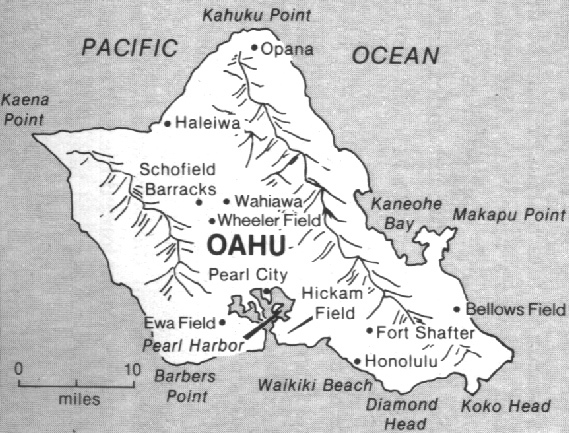 In short, Oahu is plenty large enough to defend in depth, but still small enough to be an enormously difficult nut to crack. Second, both the British garrison in Malaya, and the U.S. forces in Luzon, were composed of a grab-bag of hastily recruited, largely ill-trained native troops, along with (in Malaya) a smattering of new Indian brigades, leavened with British or American regulars. In Malaya, British or Australian troops accounted for about 40% of the force structure. In Luzon, American regulars amounted to 75% of the garrison. The garrison on Hawaii would be composed completely of American regulars. Thus, the Americans would encounter none of the problems normally associated with coordinating and maneuvering a polyglot force. Third, at this stage of the war, the initial shock of Japanese victories throughout the Southwest Pacific was beginning to wear off. The Americans had fought vigorously and bravely, if somewhat ineptly, in the Philippines, and had held the Bataan peninsula for months in the face of inevitable defeat. And while the outcome there had been a grievous loss, nevertheless the Americans felt that that had done well, as opposed to the British in Malaya and Burma, who knew quite well that they had been out-thought and out-fought. As a result, the Americans by this stage of the war no longer labored under a sense of inferiority vis-a-vis the Japanese, on land. As evidence of this, note that in the real war August 1942 witnessed American soldiers fighting and winning in the jungles of Guadalcanal and Tulagi. And while a Japanese victory at Midway would undoubtedly have been a blow to American morale, the fact that Hawaii was 'home turf' would likely have strengthened American resolve to resist. Fourth, the Americans had eight months to prepare for an invasion, meaning that defensive positions would have been dug, guns bore-sighted, mines laid in profusion, barbed wire strung, fallback lines designated and prepared, men trained, and so on. The Americans were well-prepared to fight a protracted campaign on Oahu if need be. Fifth, the Japanese benefitted in Malaya and the Philippines from brilliant staffwork based on lengthy, in-depth prior reconnaissance of the objectives. By contrast, if the Japanese were to grab Hawaii after a victory at Midway they would have to move very quickly, meaning that invasion preparations would not benefit from the same level of detailed planning. In addition, the Japanese would receive very little in the way of intelligence on American troop dispositions or defensive preparations on Oahu. To a large degree they would be 'coming in blind'. Taken together, these factors argue strongly that taking Hawaii wasn't going to be a walkover. In fact, the Japanese would have had every reason to view this operation with the same degree of trepidation that we regarded invading an island bastion like Rabaul: lots of enemy troops, heavily dug in, and seriously motivated to defend the place tooth and nail. All in all, not a pretty picture. If I were the Japanese commander, I would want more than three divisions. Five would be more like it. The idea of the Japanese having five divisions to spare for a Hawaiian invasion is completely ludicrous, of course. In fact, the Japanese Army had steadfastly opposed doling out additional combat troops for operations it perceived as being beyond the strategic scope of the conflict. It had put the scotch on operations against northern Australia on exactly the same grounds, and had only reluctantly acceded to the occupation of Rabaul. Subsequently, it had grudgingly gone along with the abortive attempt against Port Moresby that precipitated the Battle of the Coral Sea. Put simply, the Imperial Navy knew that it "could never have coaxed three divisions from the Army for such an enterprise." (Willmott, "The Barrier and the Javelin", p. 42) And even if they had done so, and landed them in August 1942, I see no reason why three Japanese divisions would have been succesful against a 100,000 man American garrison, for all the reasons cited above. So that's Big Reason #1: The Japanese simply didn't have the men to take Hawaii from us. Big Reason #2 is that the Japanese, even at the zenith of their military power, never had anywhere near the logistical capability or the amphibious expertise to transport 60,000 troops to a remote landing site, land them under enemy fire, provide them with sustained gunfire and air support, and keep them supported throughout what could easily be a month-long campaign. The invasion of Malaya, which was the single largest Japanese amphibious operation of the war, had involved a scant three divisions, and they hadn't been landed all at once, nor had they been landed into the teeth of concerted enemy fire. Furthermore, the Japanese invasion convoys in that campaign had been operating from bases in French Indochina (Vietnam), which were a few hundred miles from the Malayan beaches. British airpower was dispersed, and unable to concentrate against the Japanese landings. By contrast, Hawaii is some 3,900 miles from Japan, and almost 2,300 miles from Truk, which were the only staging areas developed enough for such an undertaking. Furthermore, the Japanese would unquestionably have been landing directly in the face of heavy resistance at Oahu. The few experiences the Japanese had had with direct amphibious assaults to that point in the war could hardly have proved reassuring to the planners of a Hawaiian operation. In fact, they had been disastrous. An example of this was the initial assault on Wake. This operation clearly demonstrated that the Japanese had nothing in the way of a credible amphibious doctrine a la the U.S. Marine Corps. Instead, when presented with a situation requiring an amphibious assualt, the Japanese usually selected deserted coastlines manned by thinly-spread garrisons. In Oahu, the Japanese would land in the face of a concentrated enemy with substantial forces in reserve. In the face of a large, entrenched garrison possessed of superior automatic weapons and artillery firepower, Japanese forces might well have faced a sneak preview, on a very large scale, of the disaster that befell them on the Tenaru River on Guadalcanal. In fact, it would not be until early 1944, when the U.S. Marine Corps and the U.S. Navy began perfecting their respective arts, that a naval force could reliably transport divisional sized units across thousands of miles of ocean, park offshore an island bastion, crush its airpower, land assault troops in the face of heavy fire, and then support the troops ashore for weeks at a time. The Japanese never possessed any of these essentials characteristics of amphibious power projection. Finally, of course, is the issue of keeping Hawaii in supply once it is taken. Even before the Battle of Midway, Combined Fleet Staff as much as admitted that Japan couldn't keep Midway in supply even if they captured it! Keeping Hawaii supplied, with its much larger civilian population and garrison, would have been even more difficult. In short, the Japanese simply did not possess the amphibious and logistical wherewithal to assault, capture, and hold the Hawaiian Islands. Finally, let's talk about air superiority. If you're going to take Hawaii, you've got to secure the airspace over it. Unfortunately for the Japanese; by August 1942 Hawaii was crawling with U.S. aircraft. In fact, by April 1, 1942, there were already 275 U.S. aircraft in the Hawaiian islands, with projected arrivals to amount to more than 350. In the face of a likely invasion, that strength could be rapidly augmented. In fact, Saratoga's air group of 90 aircraft could have been added to the island's defenses as early as June 8th. Thus, as Willmott has noted, "With so many land-based aircraft operational on well-dispersed airfields on Oahu, the Japanese had no realistic hope of being able to fight for and then secure air supremacy over Pearl Harbor." (Willmott, "The Barrier and the Javelin" p. 66). The truth was that Kido Butai, even at its finest moments in early 1942, was still only strong enough to raid Hawaii, not project power over it for extended periods of time. "Well," you say, "the Japanese could use Midway as an advance base and establish air supremacy over Hawaii from there." There are two problems with this. First, Midway makes a miserable advance base. It is about the size of a postage stamp, has no fresh water, is possessed of only a relatively small harbor, and has room for but one small airfield. At best it could operate an air contingent of about 90-100 aircraft. In other words, there was absolutely no chance of using Midway as the sort of major logistics center (a la Truk or Rabaul) for further operations down the Hawaiian chain. Midway was, at best, an outpost. Second, Midway is too far from Hawaii. Even if the Japanese had been able to install an airgroup at Midway, and keep it supplied, it had no chance of exerting a powerful influence on Hawaii, since it is nearly 1,300 miles from Oahu. During the Solomons campaign, the Japanese (who had the longest-ranged fighter in the Pacific in the A6M5 Zero) found it nearly impossible to exert air power from Rabaul to Guadalcanal, which was 650 miles away. By itself, then, Midway was useless as an advance base. If Hawaii's airpower was to be reduced, and Oahu taken, then the Japanese would have to do it using carrier-borne airpower and seaborne troops -- a virtual impossibility for all the reasons just discussed. At this point, having demonstrated the near-impossibility of the Japanese taking Hawaii after a triumph at Midway, the reader might well ask, "Well then, what if Japan had not only raided Pearl Harbor, but actually invaded it on December 7th, thereby not allowing the Americans to build up their defences, and catching them by complete surprise?" It's an interesting proposal. It's also crazy. In fact, before proceeding to discuss the operation on its merits, let's all just acknowledge up front that the Imperial Army would never have authorized the committment of ground forces to Hawaii on Day One of the Pacific War. As it was, Yamamoto, through dint of his enormous personal prestige (and his rather shabby threats to resign unless he got his way) barely received permission to conduct a raid on Pearl Harbor. The apparent success of the attack has had the effect of dimming our recollection of how frought with peril the raid truly was. Attacking a major military bastion like Oahu, which bristled with land-based aircraft, and with the bulk of the American fleet present, was more than bold. That the Imperial Navy actually made the attack work, through dint of their superb operational planning, and plenty of just plain luck, should not be taken as an indication that the operation was somehow pre-ordained to succeed. Indeed, the Imperial Navy anticipated losing two carriers at Pearl Harbor, and knew that should their force be discovered before it could reach a launch point it might well be subjected to a crippling attack by both Hawaiian and carrier-based airpower. In the face of such opposition, the potential for a major disaster was very real. Given these realities, the suggestion of sending a slow-moving invasion convoy into Hawaiian waters, even escorted by Kido Butai, would have been proof of insanity of an altogether different degree. Nagumo's Strike Force had the ability to dash into, and out of, air range of the Hawaiian islands at high speed, thereby limiting the Americans 'window of opportunity' to detect and attack it. This, in turn, increased the odds of achieving surprise, and decreased Kido Butai's exposure to counterattack. An invasion convoy would enjoy no such luxury. It would plod in at 10 to 12 knots, and then have to be prepared to sit offshore and take whatever beating the Americans could dish out for days, or even weeks, on end. The slower speed of the convoy would also greatly increase the odds that the Americans would get wind of what was underway before a Japanese attack could be launched. And then there was the issue of keeping Hawaii in supply should the attack succeed. In short, any officer who seriously suggested such an operation would most likely have been cashiered, and the odds of actually getting such an operation approved by Imperial GHQ was zero. 15th Army (tasked with taking Thailand) Largely cadre units, 33rd Div., and elements of the 55th Div. In other words, the Japanese had 11 divisions to play with to achieve their objectives in the Pacific. Next, let's examine what it takes to move those forces around. 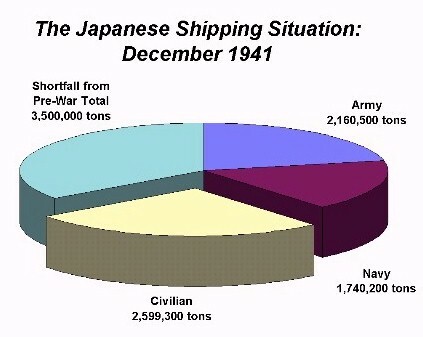 According to Mark Parillo, in "The Japanese Merchant Marine in World War", p.75, at the begining of the war Japan had roughly 6.5 million tons of shipping under her control. At the start of hostilities, the Imperial Army drafted 519 vessels of 2,160,500 tons, two thirds of which (1,450,000 tons worth) were intended for landing purposes. Of that, 1,350,000 tons was earmarked for the Philippines and Malayan operations. The Navy drafted another 1,740,200 tons, most of which was presumably devoted to sustaining the fleet in foreign waters. Thus, nearly 4 million tons of Japan's 6.5 million total tons of shipping was drafted for military purposes, leaving 2.6 million tons for the civilian economy (i.e. the people who make the guns and bullets). Not only that, but the civilian economy actually needed 10 million tons of shipping to supply it, the remainder having been made up before the war by cargo carried in foreign (mostly Allied) cargo ships. So in actuality, the Japan started the war 3.5 million tons in the hole. The Japanese economy was being expected to fight a major, multi-theatre war, while subsisting on 25% of its prewar shipping requirements! Taken as a whole, it is difficult to imagine how Japan could have freed up any additional shipping to increase the potential size of the amphibious pool. As a result, when constructing an early war strategic scenario, it is important to remember that the size of Japan's amphibious lift pool is stringently fixed. This pool was roughly sufficient to move eleven divisions around the Pacific and still keep the forces on the Chinese mainland in supply. This, in turn, rigidly restricted the potential scope of Japanese operations. In other words, Japan had to capture what it could with eleven divisions, and no more. In reality, Japan was presented with the equivalent of a zero sum strategic game in the Pacific. Its strategic goal had to be to maximize the fruits of eleven divisions' labors. The question arises, then, if Japan had made the decision to commit three divisions to an invasion of Hawaii on December 7th, what other objectives in the Pacific were they willing to give up? In my estimation, the inevitable answer has to be: none. After all, the overriding purpose of the war the Japanese had committed themselves to waging was securing the resources of the Southwest Pacific (i.e. oil) as quickly as possible. The luxury of time was distinctly not in Japan's favor. Her petroleum stockpiles were insufficient for large-scale, protracted hostilities, and her ability to increase domestic production was negligible compared to the needs of her military force structure (particularly the Navy). Thus, committing forces to an objective which did not directly further the securement of these natural resources was insupportable. Taken in this light it is clear that Japan needed every one of those eleven divisions right where they were committed historically. Taking the Philippines was vital, because it destroyed the only credible bastion of American power in the Far East. Further, the Philippines sat directly astride the Japanese supply lines which would (presumably) soon be carrying the wealth of the Indies back to the Empire. Leaving an enemy force in such a flanking position was not an option. Indeed, Japan's initial war plans contemplated moving against the Indies only after the Philippines were completely in Japanese hands. For the very same reasons, Malaya also had to be captured. The British presence on the peninsula, and the enormous naval base at Singapore, were like a knife pointed at the Indies. Malaya could not therefore be bypassed safely; it had to be eliminated as a threat, and swiftly. Taken in this light, it is scarcely surprising that the Philippines and Malaya between them accounted for more than half of the total Japanese ground forces deployed in the initial campaign, and more than 90% of the Army's amphibious tonnage. Of the remaining combat theatres, Burma was perhaps the least vital to the whole operational concept. However, it was still important in securing the flank of Malaya from the threat of British counterattacks mounted from the Indian frontier, or via the sea against the Malayan isthmus. Furthermore, the forces committed to Burma, comprising a division and a regimental group, had the advantages of being fairly small. They could also be deployed via Thailand, thus conserving valuable sealift capability. The division assigned to capture Hong Kong was much the same story, except that it was also earmarked for subsequent deployment against the Indies themselves, and could not thus be assigned elsewhere. Finally, the regimental team charged with overruning all of the South Pacific was important to ensuring that Wake, Guam, and the other minor American bases caused no trouble on the frontier. The bottom line is that the Japanese might have abandoned the campaign against Burma without upsetting the logic of the larger plan. But the division and a third thus freed up was scarcely capable of securing Hawaii in the face of 40,000+ American Army troops. And once the shipping necessary to support the Philippines and Malayan campaign was subtracted, the Japanese didn't have the requisite shipping tonnage necessary to deliver these 4+ regiments to Oahu even if they had wanted to. The 100,000 tons of amphibious shipping left over after the Philippines and Malayan operations was scarcely sufficient to land and support a reinforced division. One is drawn inevitably, then, to the conclusion that even if the Japanese had wanted to, they didn't have the ability to undertake both a Hawaiian operation and the intricate series of attacks which they envisioned unleashing against the Southwest Pacific. They had to make a choice. And given the rapidly depleting raw material stocks in the Empire, necessity dictated that the Indies be captured at all costs. A richer nation might have had the option of gambling and opting for an attack on a set of islands which possessed nothing in the way of raw materials. Japan in late 1941 could afford no such luxury. Taken as a whole, it can be seen that a Hawaiian invasion was hardly likely, regardless of the stage of the war. While an attack at the outset of hostilities might have succeeded in capturing the islands, it was strategically unsound, suffered from by horrendous military and logistical difficulties, and was risky to the point of lunacy. A defeat at Hawaii in which either Kido Butai or the amphibious forces involved suffered major losses would cripple the Japanese war effort before it had fairly begun, and make securing the resources of Southwest Asia much more difficult. Given the slender logistical base upon which the historical Japanese campaign was conducted, it is difficult to imagine how Japan would have been succesful under such circumstances. An invasion of Hawaii after a victory at Midway was scarcely more realistic in terms of logistics, and had the added detraction of facing a very large, dug-in garrison who had had months to prepare their defenses. The Japanese chances of success in such an operation were minimal. In short, the hysteria surrounding a Japanese landing on Oahu must remain largely that: hysteria, grounded in the fears of a shaken public who were unfamiliar with the logistical realities of the Pacific War. Even in the darkest days of the war, in early 1942 with the Allies suffering defeat after shattering defeat, and the myth of Japanese invincibility at its height, the actual odds of Kido Butai being able to assault Oahu and then go on to prowl the west coast of the United States were practically nil.